Mira Lee and Howard Waitzkin have lived in their current home since 2012. In 2013 they started planting native plants. NLI certified their property in the summer of 2018 as a [email protected] site. Even though they live in town (Loves Park), their home is on the Rock River and provides a rural setting, especially with their variety of wildflowers and trees. What kinds of native plants have you used in your landscaping? We have a long, narrow lot which extends from the street to the river. Planning for natives has been a little challenging, because the river floods frequently but then, when the soil dries out, much of the land is in full sun. There are many trees, mainly maples, on the street side and on the river side before it slopes down to river level. So we’ve planted mainly woodland species on the street side and elevated areas on the river side due to the trees and shade, and wetland species along the river that can tolerate sun and dryness as well as flooding. We also have tried to achieve blooms throughout the growing season. 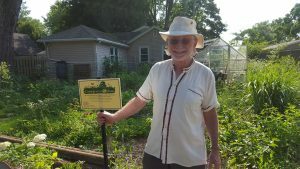 Mira is a Master Gardener and did most of the design and a lot of the work. The woodland species (using mostly common rather than botanical names) include wild senna, ferns, columbine, clematis, bottle gentian, wild geranium, Michigan lily, Penstemon, phlox, bloodroot, rue anemone, trillium, bellwort, May apple, brown-eyed Susan, black eyed Susan, Jacob’s ladder, Virginia bluebells, dwarf crested iris, goldenseal, hepatica, wide strawberry, common milkweed, butterfly bush, coneflower, great blue lobelia, wild lupine, queen of the prairie, and Joe Pye weed. 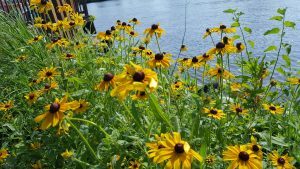 Flood and sun-tolerant species include cardinal flowers, ironweed, New England aster, goldenrod, cup plant, swamp milkweed, wild petunia, obedient plant, marsh blazing star, dogwood, elderberry, and swamp rose. We’ve gradually obtained plants and seeds from Wild Ones, Red Buffalo Nursery, and friendly native gardeners, and Prairie Moon nursery. We’ve been surprised that our planning mostly worked well, including during and after the four floods that we’ve experienced in the last 1 1/2 years. At this point, the gardens appear self-sustaining and mainly require thinning and taking out occasional invasive species. That’s a hard question. 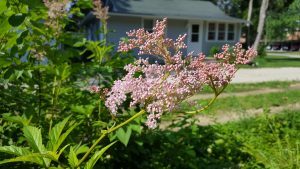 Usually the colorful ones such as cardinal flower, blue lobelia, obedient plant, milkweed, and butterfly bush; plus those that remain in wabi-sabi beauty through the winter, such as senna, Joe Pye weed, cup plant, and swamp rose. What other conservation practices do you do? Composting, rain barrels, a small pond made from our old bathtub, a hand mower for the remaining grass mostly in the paths, removing all grass by lasagna mulch and de-turfing rather than using any herbicides, pest control by nematodes, mantises, and so forth rather than any pesticides, bird feeders, pollinator care, a greenhouse, harvesting maple syrup (yum). We’ve begun to look into solar but have some issues with shade that make that option challenging. What, if any reaction do you get from your neighbors? Initially we received mostly negative reactions from neighbors, despite our unsuccessful attempts at diplomacy including preparatory discussions, asking for input, etc. 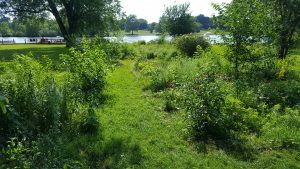 Neighbors reported us to the City of Loves Park, and we received various warnings from town officials, for instance, to remove milkweed because it’s a weed; we had to get folks from Springfield involved to show that we didn’t have any officially designated weeds on the property. Mentoring from Wild Ones wise people like Tim Lewis and Ginnie Watson helped us a great deal in these tribulations. Tim’s suggestion to get some Wild Ones and other conservation groups’ signs to put up seemed to soothe some of these negative reactions. In fact, multiple neighbors more recently have expressed positive and very supportive comments, we get a lot of visits from neighbors, especially children, and we have not received any complaints at all since we put up the sign showing that the property has been “recognized” by the [email protected] program of the Natural Land Institute. What was your motivation for landscaping with native plants? We both love gardening, which seems partly an inheritance from prior generations of our families. Learning about native plants here in the Rustbelt has been a wonderful, very gratifying experience despite all the above hassles, partly due to the spiritual, meditative connection to the earth and its fellow creatures. We now love insects – not just the delightful monarchs and swallowtails, or the amazingly beautiful fireworks produced by thousands of fireflies that perform, seemingly for our benefit, on warm June nights from dusk to dawn, but even the beetles and wasps that are clearly doing their good works to create a sustainable environment. How has your motivation changed over time? We started deeply concerned about the adverse effects of capitalism on the environment, as well as on poverty, inequality, racial conflict, war and militarism, health and mental health, etc. We recognize that our efforts at conservation and restoration of native plants ultimately will fail if we don’t move beyond capitalism for our own and our planet’s health. It has been said that “it’s easier to imagine the end of the world than the end of our economic system.” Yet figuring out how to do that economic transition, and then doing it, for us has become the key collective task as we and our children try to live worthwhile and meaningful lives during this, our most critical period of human history. What does the [email protected] certification mean to you? Unexpectedly, the certification has proven much more meaningful than we anticipated. The sign indicating recognition by the NLI has improved our previously adversarial relationships with some neighbors and the town government. Beyond that, sharing the “mutual aid” in this community of conservationists spanning Wild Ones, the NLI, and other groups confirms our beliefs and values oriented to preserving our beautiful planet and the beings that inhabit it. The certification also reinforces our view that, in our day-to-day lives, we need to deepen our achievements in developing a solidarity economy outside the ecologically destructive economic system that we inherited. Personally, we feel that acting consciously to embody our environmental values in all our economic behaviors has become our only hope for a sustainable future. Just thank you very much for providing an opportunity to share my gratitude for all you do on behalf of the environment and its inhabitants, and also for the opportunity to offer some heartfelt comments that I otherwise might not have found a voice to express.